This will be a much-enjoyed gift for the "tween" girls in your life. It's great for birthday parties, slumber parties or just for fun with friends. Just added is our sports design for girls or boys. 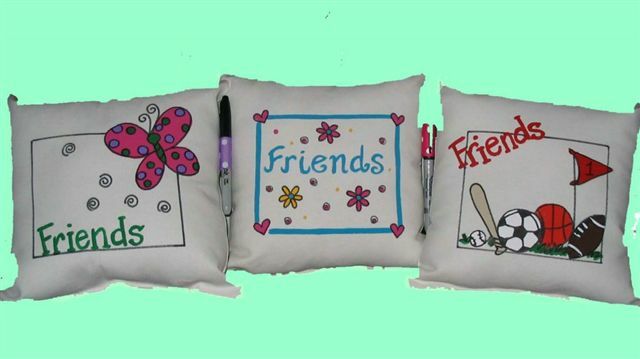 The friends motifs are hand painted on white canvas. The pillow measure about 11" x 11" and has lots of room front and back for signatures. It also has its own permanent marker attached with a ribbon hoop on the side. Let us know the reciepients name and we'll personalize the pillow for free!